Aaj ke article me hum internet se jude kuch important terms ke bare me jankari hasil karenge jis me aap website. web page, blog aur blogging ke bare me difference, benefits aur function sikhenge. Is post me aapko mention kiye gaye terms se related puri jankari di jaye gi taki aap in terms ko achi tarah understand kar paye. Online paisa kamane ke liye newbies ko pehle website. web page, blog aur blogging ke bare me achi knowledge honi chahiye tabhi woh apna online business start kar sakte hai. Yehi soch kar maine aaj ye decide kiya hai ki kyun na apne readers ke sath important terms ke bare me jankari share ki jaye taki har beginner blogging se paise kama sake. 1. What is a Website? Website ek domain hota hai jisko hum web browsers se access karte hai. Website me bahut sare scripts, images, multimedia files aur few web pages hote hai jo single domain URL ke under different function karte hai. Website ke web pages static hote hai jinko bahut samay baad update kiya jata hai. Har ek website me different speciality, quality aur functionality hoti hai jo computer programing language ki madad se functions karte hai. Website ke homepage par hyperlinks hote hai jo visitors ko different webpages par le jata hai. Website me bahut kam text hota hai jis se ye pata chalta hai ki website par bahut kam percentage me HTML hota hai aur zyada scripts hote hai. Example: Facebook, Twitter, WikiPedia, etc. 2. What is a Web page? Ek web page humare websites aur blogs ka subset hota hai jo mukhy website ke sath connected hota hai. Web pages HTML (hypertext markup language) me hota hai jisko access karne ke baad web browser simple text me translate karta hai. Web pages do tarah ke hote hai. Ek static aur dusra dynamic. Static web pages ziyada tar websites me hota hai aur dynamic blogs par. Har ek webpage me mukhy website ka address hota hai aur uske baad webpage URL text hota hai. For example, www.google.com mukhy address hai aur www.google.com/about/our-company iska webpage hai. Aap dekh sakte hai ki is web page me sabse pehle site ka mukhy domain show ho raha hai aur iske baad, web page text ke according URL hai. Websites ke webpage PHP, Perl, ASP, Python, JSP etc. me likhe jate hai aur blog webpages HTML me likhe jata hai. Blog ke web pages ko posts aur articles bhi kehte hai But website ke web pages ko keval web pages hi kehte hai. Web pages do tarah ke hote hai. Ek scripts web page aur dusra multimedia/constectual web page. Script web page website par hote hai aur multimedia/constectual web page blogs me hota hai. 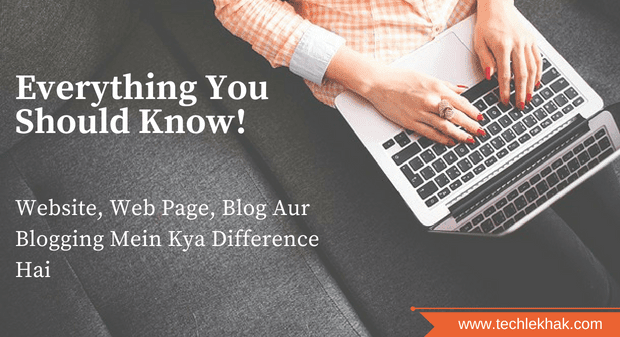 Blog information hub hota hai jaha par aapko different types ki information milti hai aur yeh information different web pages par mention ki jati hai. Blogs ko knowledge, information, educational, training aur conversational purpose ke liye create kiya jata hai jaha par readers ko kisi cheez ke bare me jankari di jati hai. Blog ko chalane wale vyakti ko blogger kehte hai. For example, agar aap internet par "how to boot android" search karenge to ye jankari blogs par milti hai jisko blogger ne explain kiya hota hai. In fact, blogs/bloggers ke bina internet ZERO hai. Jab hum Internet par kisi bhi problem ka solution ya question search karte hai to uska answer bloggers ne apne-apne blogs par mention kiya hota hai jisko read karne ke baad aap ke questions ka answer mil jata hai. Blogs par different article likhe jate hai jo blog ke different web pages par access kiye jata hai. For example, techlekhak blog par is time 89 article hai aur ye 89 article 89 web pages par likhe gaye hai jinko aap posts bhi keh sakte hai. 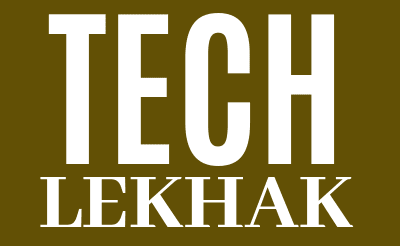 Example: TechLekhak, TechRadar, HindiMeHelp, Knigulper, BlogNetBook, TechCrunch, Gizmodo, TechVibes etc. Blogs par chronological order me articles likhne ko bloging kehte hai. Ye alag baat hai ki blogging se earnings ki jati hai But internet me blogging usko kehte hai jis me daily basis par articles, images, videos, music etc. share kiye jate hai. Blog ek online dairy ki tarah hota hai jaha par roz-roz article likhne ko blogging kehte hai. For example, drive and driving, Eat and eating, Write and writing, walk and walking, format and formatting, speak and speaking, browse and browsing, blog and blogging. Har ek blog website hota hai But har website blog nahi hota hai. Aap jo bhi online domains URL visit karte hai woh sab websites hote hai. I hope ki aapko samajh me aaya hoga ki blog, blogging, website aur web page me kya difference hai. Agar aapko koi confusion hai to aap comments me bhi apne questions puch sakte hai. Agar aapko ye article (webpage) pasand aaya ho to isko apne friends ke sath zaroor share kare.